The November Swine Budgets and budgets for the entire year are available on the OMAFRA swine website 2015 Swine Budgets. Grain Farmers of Ontario farmer-members are invited to attend a full-day marketing seminar during the months of January and February. These seminars will introduce producers to Options on futures. Participants will be shown how to incorporate Options into their marketing strategies. Seminars will be led by Marty Hibbs, grain merchandiser with Grain Farmers of Ontario. Hibbs is a 25 year veteran futures trader, analyst, and portfolio manager. He was a regular guest analyst on BNN for four years and is currently authoring the Market Side education series on futures trading basics in the Ontario Grain Farmer magazine. Note: Pre-registration is required. No walk-ins will be permitted. To reserve a seat call Marty Hibbs 1-800-265-0550; email: mhibbs@gfo.ca; or go online at course information. Venue and start time details will be provided through an email with your registration confirmation. The Canadian livestock estimate has been released by Statistics Canada. Canada exported 2.8 million hogs in the first half of 2015, up 17.8% from the same period in 2014. There was strong demand for hogs in the United States as slaughter was 7% higher in the first six months of 2015 compared with the same period in 2014. According to the most recent US data, hog inventories increased 9% from June 1, 2014. 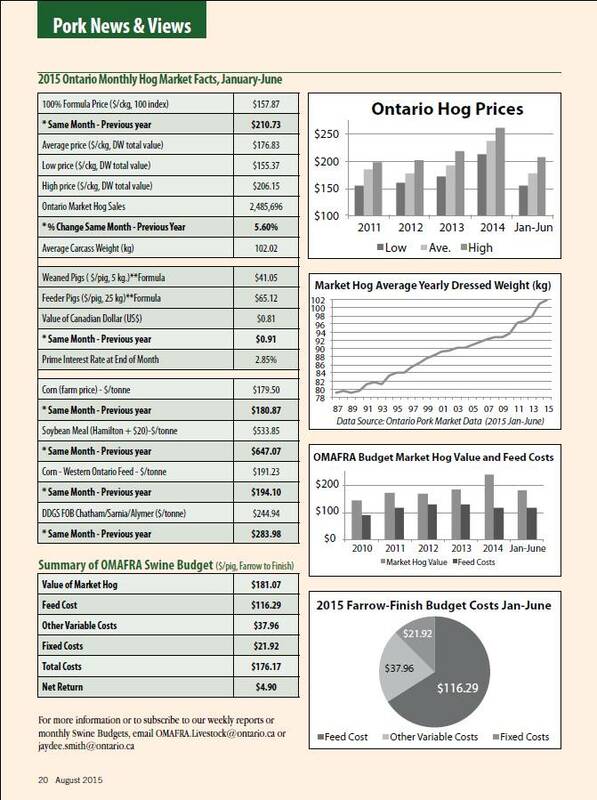 The Ontario hog market situation for the first six months of 2015 was summarized in the recent issue of Pork News and Views (click image to view).